Kenneth Branagh struck many people as an unusual choice to direct Thor, not a bad choice, just an unusual one. It turns out that he was an excellent choice, for Thor is an absolute triumph, quite likely the best film from Marvel studios yet; meaning that it trumps Iron Man. 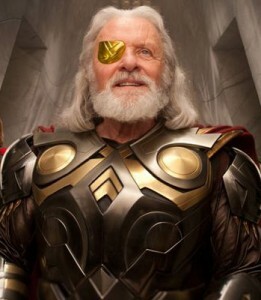 Thor (Hemsworth) was always going to be a difficult character to put on film. His background of coming from a highly advanced and mythical race which inspired the legends of the ancient Vikings does not quite gel with the rest of the Marvel movie Universe. Spider-Man was bitten by a radioactive spider from a science lab, The Incredible Hulk was exposed to gamma radiation in a lab, The Fantastic Four were exposed to cosmic radiation in a science laboratory in space, Iron Man is a scientist who invented an iron suit. All of these characters come from science (fantastical and impossible, yes) but very much grounded in Earth’s science. Thor is an entirely different ball game. Thor takes mythology and fantasy to a whole new level, with only the barest of connections to Earth science. So how does this film manage to bring these two distinct worlds together? Well for a start, Branagh makes the very wise move of opening up on earth, with a small band of three scientists led by Jane Foster (Portman). The rather simple yet fast paced scene lodges earth scientists in our minds before we are whipped away to have Thor’s world explained to us. The tale of how Odin (Hopkins) led the people of Asgard in a war against the Frost Giants to unite the Nine Realms. The entire sequence is put together incredibly well. The first sight of Asgard is a huge moment. The land is so immense and beautiful with incredible attention to detail, and revealed in such a way that one cannot be left in a state of complete awe. Odin’s battles with the Frost Giants are excellently put together, laying to rest early on any fears you may have about Branagh’s ability to do action. The 3D and CG aren’t always perfect but the 3D is still used well enough that the film is better off with it than without, and the CG gets it right in the details making a better overall impression than last year’s Tron: Legacy. Once the mythos of Asgard has been explained we are introduced to Thor and Loki (Hiddleston), Odin’s sons. 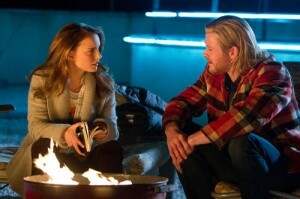 Their characters are well established before Thor’s character leads him to defy his father and be cast out of Asgard to Earth, where he is picked up by the three scientists from the opening sequence. What follows is fairly typical fish out of water fare, which Branagh mines for every ounce of humour. The humour mining goes a little bit too far in Darcy (Kat Dennings), Foster’s intern. Darcy is equal parts funny and annoying and not much else, but the rest of the humour works. As Thor is left to find his place on Earth there is some political intrigue going on in Asgard. The banishment of Thor has left many people at a loss and the complexities in the royal family begin to cause problems. This section of the film could have suffered from middle act lull but it does not. The characters engage very well and one of the film’s real strengths continues to emerge. Every movement in the plot comes from the characters which populate the film and never from random external events. Every characters’ actions make sense to who they are. And these are not simple characters either, they are by and large quite complex with a myriad of emotions and motives. The fact that every single member of the cast brings their A-game to portraying these characters also helps, though that was never really a concern under the direction of the very performance-minded Branagh. Thor, being the central character, is naturally very well developed. He also continues to develop through the film. His journey through the plot does genuinely change him but very subtly and logically. Eventually the interactions of all the characters results in a threat from Asgard on Earth; the two worlds collide. The ensuing sequence is again expertly put together as the characters are woven into the action. Unfortunately it’s at this point that something a little bit ridiculous happens. There is a moment which occurs not so much due to the actions of a character, but more, inspired by the actions of a character. The moment very nearly works, for all that’s needed to fix it is the ever so slight tweaking of one particular speech from earlier in the film, but as it stands, the moment jars. It’s not wrong, just a little bit out of step. This moment is then followed by pretty decent fight, but which could really have done with being kicked up just another notch or so. A slightly longer peak would have been nice. It really is from here that cracks begin to appear. Having saved Earth, Thor returns to sort out the problems on Asgard and confront Loki, who has been making things difficult for everyone. 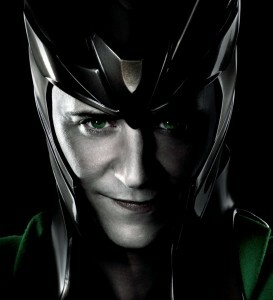 Loki is generally very well crafted and complexities of character make him an interesting villain. But for the last act he begins to creep into areas of black and white. Instead of sticking to the extremely hurt, confused and misguided character he’s been up to now, he starts to become just the bad guy. The character is still there, and the complexities are maintained in the end, but some of the actions in the final act and climactic battle are just the actions of the bad guy and not the more complicated Loki that has been there up to now. This is all counter balanced by Thor being awesome though. The cracks that appear in the final act are far outweighed by the climax; the climax to a film which has made sense throughout, both from properly established characters to carefully crafted references; references to other Marvel works, such as the cameo of Jeremy Renner as Hawkeye and the fleetiest mention of The Incredible Hulk. But also, very importantly, proper references to science. Not to Stan Lee science where the use of the word “radiation” solves any problems, but to proper science. Rather than wormholes, the scientists talk about Einstein-Rosen bridges. By elevating the status of science in this film beyond the level of mere fantasy it allows mythical Thor to exist in Marvel’s scientifically based universe. Branagh gets the tone just right. There are some cracks but overall Thor manages to be both a properly grounded earth based film while simultaneously being a huge, epic, mythical, galactic film which will not only satisfy, but delight the most discerning of fans. I just hope that June’s Green Lantern manages to come close to matching the balance struck here. Thor is released on April 27th.